String curtain material is great because it flows and moves like few other materials do. It lights up well with LEDs and comes in a small handful of colors. On the other hand, it also comes with a high price tag, tangles easily, and is usually only available up to 20’ high. It also is only attached together one one end and is not printable. A new product is out on the market that certainly takes the concept of string curtain one step forward, in my opinion. A large array of textiles can be slit into ¾” strips at a virtually unlimited height. 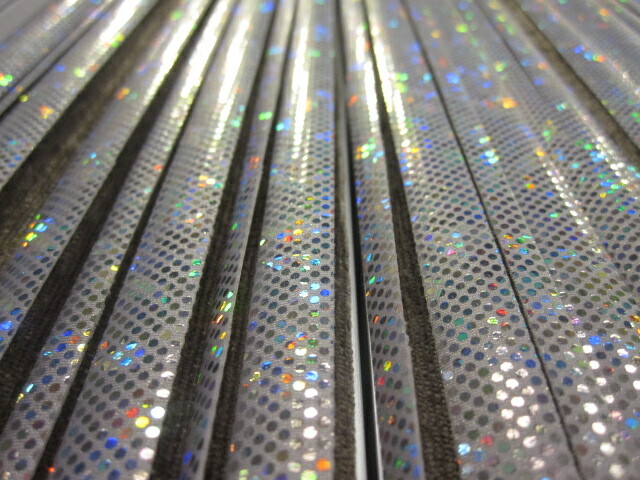 The effect is similar to string curtain and the array of available materials includes hologram dots, swirls, over 40 solid colors, metallic, custom prints, and more. The increased possibility of length, huge gamut of fabric options and lower price combined with thicker strips that resist tangling make for a great new product!